We have been tied to Dock 4 at Marina Palmira in La Paz for the past two weeks, where we have been finishing up our project list and moving on to phase two of provisioning for our Pacific crossing. (We did some initial provisioning at Costco in San Diego.) This marina is about two miles from the downtown center--and an additional half mile from the nearest supermarket--which makes grocery shopping a chore (we usually walk in and taxi back); but it is cheaper than the downtown marina, Marina de la Paz, and we suspect there are fewer distractions. 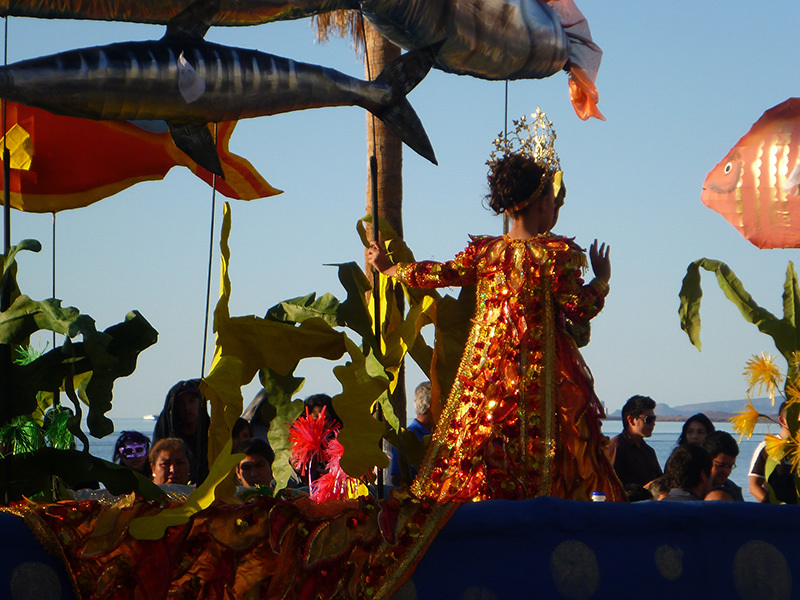 An added bonus is that we have been able to sleep at night during the last week, when the town of La Paz has been celebrating Carnaval! Patrick and I took a break from the project list to check out the festivities. 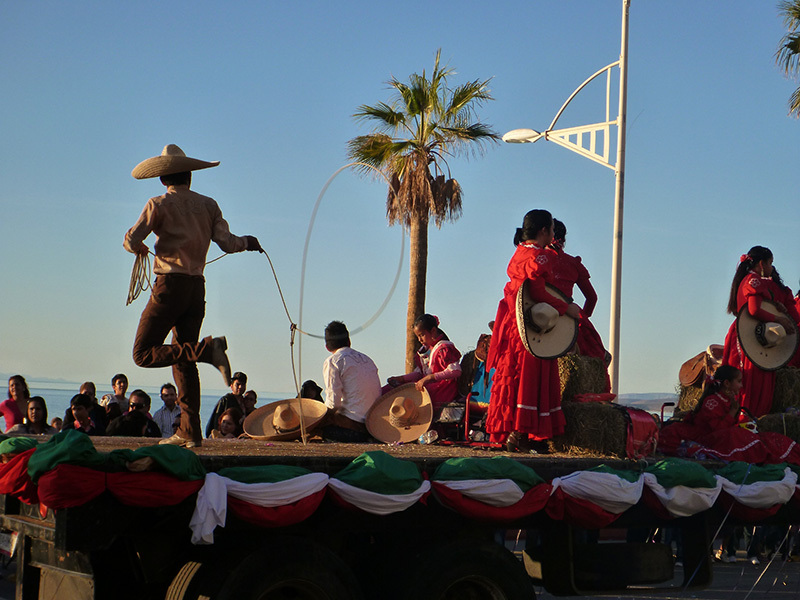 La Paz can definitely put on a good party! Although Carnaval in Mexico was surely not the spectacle you would find in Brazil or Trinidad (Mexico has a more modest culture), it was just as creative. 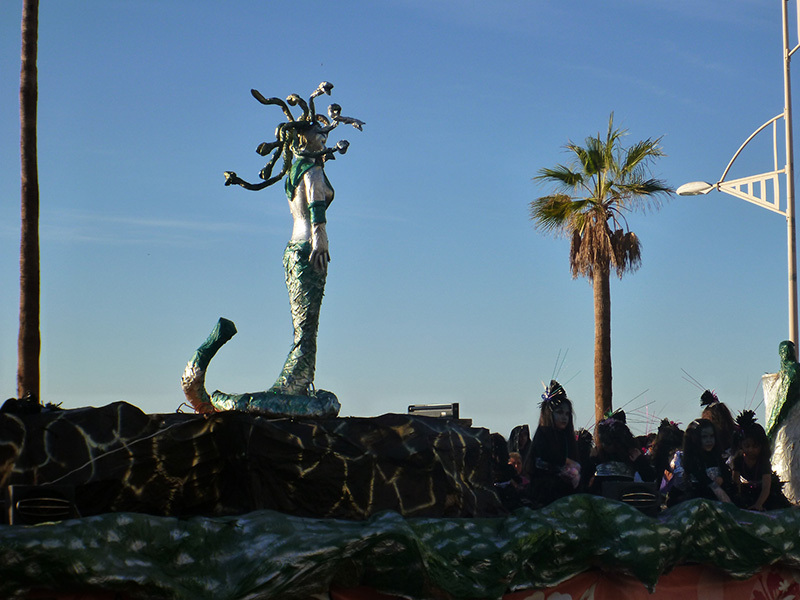 The theme of this year's Carnaval was Myths, Legends, and Characters. We attended opening night. I was hoping to see the coronation of the Carnival Rey y Reina; however, the artistic program that was supposed to start at 6:00 was just starting at 8:00, and we faded before the reigning king and queen were appointed. We did see some belly dancing troupes and indigenous dancers. 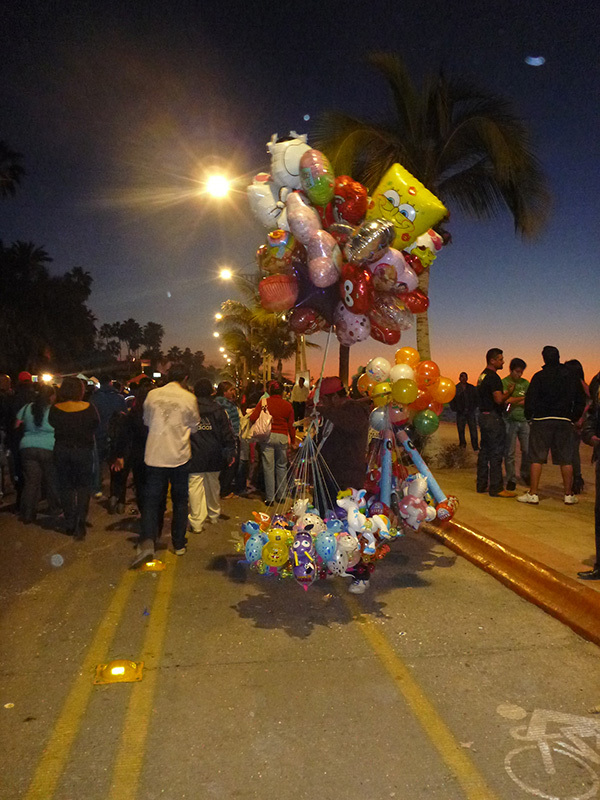 We also explored the main thoroughfare along the malecon (waterfront walk). There were all kinds of food booths, carnival games, an amusement park, and tropical drink stands. It was fun to be among the many excited Mexican families out enjoying the evening. It was interesting to note that the drinking establishments for the festival were not cordoned off like the beer gardens in the states, and people could walk along carrying their drinks. This fact, coupled with another difference between Mexico and the states---more pedestrian hazards---made for some interesting navigation off the boat. Here, one must be constantly vigilant of the uneven streets and sidewalks, curbs sometimes two feet high, random steps leading to nowhere, and gaping, open holes in the middle of the sidewalk. 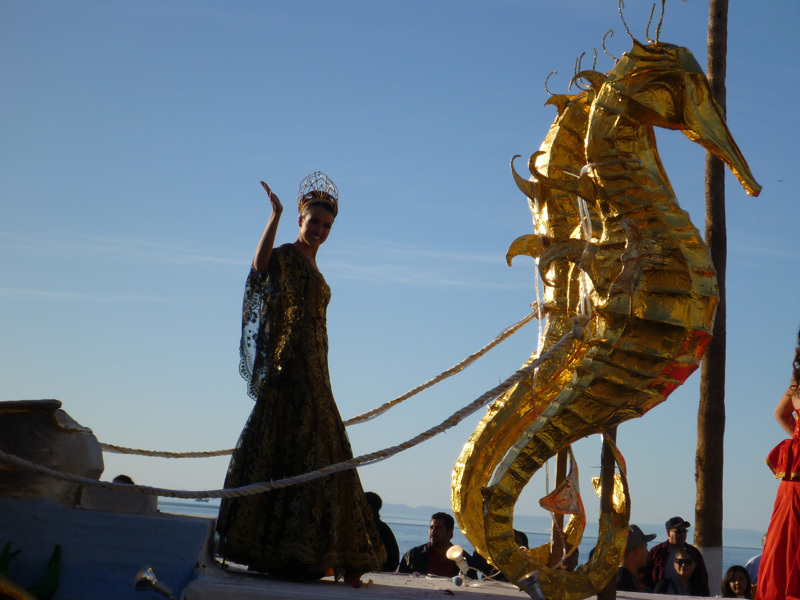 Most evenings during Carnaval started with a Carnaval parade. On Sunday, Patrick and I knocked off work early and found a sidewalk table at a local cantina to watch the parade from. Some of our dockmates from Dock 4 wandered by and joined us for drinks and nachos while we watched the parade. A good time was had by all. 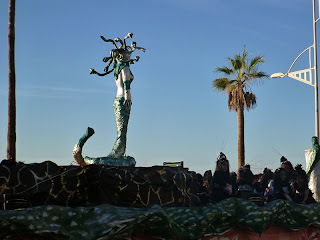 Many children were represented among the Carnaval floats. At least one Brazilian-themed float was in evidence. 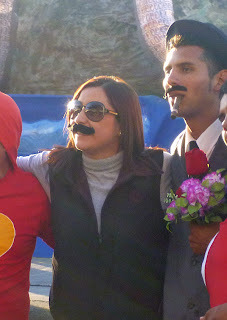 Fake beards and moustaches were on sale for 10-15 pesos, and some of the Mexican women sported them. ....were not exactly matched by this cowgirl's. One custom that appeared to be both traditional and frowned upon was the lobbing of eggs full of confetti at the parade participants. Many vendors were selling these eggs (real egg shells with confetti inside) along the carnival route. Children along the route had huge stockpiles of them, which they threw at the floats and costumed participants. Yet, there were also people walking alongside the floats carrying signs that said "Please don't throw objects of defilement" with pictures of the eggs on them. Perhaps this is a Mexican tradition in flux? We enjoyed our first experience of Carnaval in La Paz! OMG, Kirsten. We just watched your bull riding! Your bravery must have been fortified; though, you walked a relatively straight line after you were bucked off. S/V (Sailing Vessel) Silhouette is a Cabo Rico 38 cutter rigged sailboat. Patrick Dayshaw and Kirsten Rohrbach are her crew. Disclaimer: We post position reports when it's convenient and/or possible to do so. Lack of a recent report should not be cause for alarm. 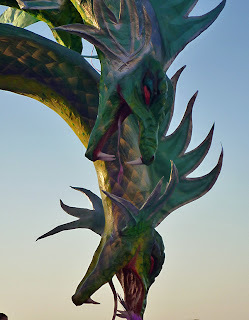 All photos on this blog were taken by either Patrick Dayshaw or Kirsten Rohrbach unless otherwise noted. Please contact us for permission and the appropriate photo credit before using our photos in a public forum.